As we get older, life, it seems, becomes increasingly filled with commitments and responsibilities. Most days I find myself running from one task to the next: eating lunch in my car as I frantically run errands over my lunch break, squeezing in phone calls to family and friends during my ten minute drive to work, and agonizing over work assignments and deadlines while I sleep. My car is my virtual office, my Facebook page is my only connection to my loved ones and I tend to think of life in key strokes, wishing I could CTRL + Z (undo) my error in judgement the other night when I added too much detergent to the laundry and found myself swimming in a sea of bubbles. Sometimes it feels like my mind and body never truly rest. And I’m not even 30. Decide what’s most important in your life and don’t take those things for granted. Respect your time; don’t waste it on things that don’t matter to you. Do your best and learn to accept when that’s just not enough. Erika Liodice is the author of Beyond the Gray, a motivational blog for anyone chasing a dream, and a regular contributor to travel e-zines Lehigh Valley Insite and The Savvy Explorer. I love the ball analogy! 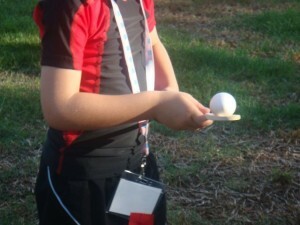 You always hear about juggling, but never the make-up of the balls being juggled. Perspective is a great thing! Beyond the Gray is a great metaphor for when we are caught in between something, the gray area, so to speak. She has a great JD Salinger quote there today. Brilliant! Hi Craig – The ball analogy is one of my favorites; glad it resonated for you too! Jeff – Thank again for allowing me the privilege of being your first guest blogger! Erika, you are very welcome.